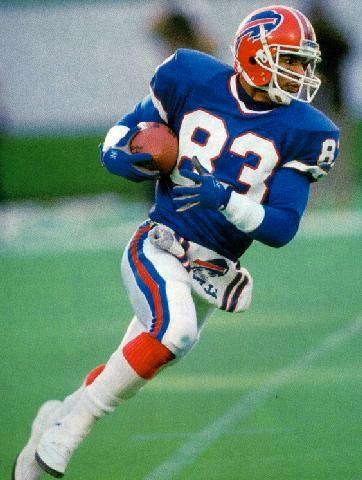 Andre Reed was a very dangerous receiver with the Buffalo Bills in the late 80s and early 90s. As many of the NFL’s best ever gather for the Pro Football Hall of Fame enshrinement ceremony, Andre Reed, who has been a finalist 7 times, remains on the outside looking in. Many forget how dangerous Andre Reed was with the football when the Buffalo Bills rose to prominence back in the late 80’s. He was a budding superstar before the Bills brought in James Lofton during the 1989 season. Essentially and unselfishly he sacrificed personal glory as a slot receiver where he spent most of his time getting hit by linebackers and running away from safeties as he perfected the run after the catch. He could have been a prima donna and cried through the media for more passes, but he didn’t. He sacrificed for the good of the Buffalo Bills and it could be those lack of numbers now keeping him out of the Hall. So lets take a closer look. During the early 1980’s, the Buffalo Bills were a downtrodden franchise with little direction. The Bills had stumbled in the standings from 1982-1984. going 14-27. The area was economically depressed and morale was low on a football team that was literally Siberia in NFL circles. However that changed in 1985 with the first overall draft selection of future Hall of Famer DE Bruce Smith and spent a fourth round pick on a little known receiver out of Kutztown St. Who?? Exactly. This was the draft where the pre-draft talk was on Jerry “World” Rice of Mississippi Valley State, and Al Toon out of Wisconsin. However there was talk brimming on a little known receiver shuffling off to Buffalo. Reed as a rookie showed promise as he caught a modest 46 passes for 637 yards and 4 touchdowns. He and Smith were the first cogs in a rebuilding project that would include QB Jim Kelly in 1986, Shane Conlan, Cornelius Bennett in 1987, and Thurman Thomas in 1988. The Bills became a defensive minded team that ran the ball with a combination of Ronnie Harmon, Thomas, and Robb Riddick. It was the 1988 season, Reed’s fourth, where the team took off racing to an 11-1 record and became the first team to win their division by Thanksgiving. Reed made the Pro Bowl for the first time that season catching 71 passes for 968 yards and 7 touchdowns. Despite missing two games to injury. The Bills dropped the Houston Oilers 17-10 in the divisional round before falling to Cincinnati in the AFC Championship Game 21-10. However it was the 1989 season where Andre Reed and the Bills offense hit full stride. For the record, he had become the NFL’s most dangerous receiver after the catch. In a year where the Bills found themselves in shootouts they opened up the offense with a no-huddle reminiscent of Kelly’s run & shoot USFL days. Reed burst into the nation’s consciousness when he had a 5 catch 135 yard 2 TD performance in a wild 47-41 overtime win against Houston. It was the game of the year and in spectacular fashion, Reed took a routine 5 yard pass and turned it into a winning 28 yard score. He juked the initial defender covering him, ran through an attempted arm tackle and took it down the sideline. Ballgame!! Reed finished with 88 receptions for a career best 1,312 yards and 9 touchdown (#2 in NFL /receptions) and became one of the league’s game breakers. As the 9-7 Bills limped into the playoffs, they faced the aging Cleveland Browns in a divisional playoff. With his team down 3-0, Kelly 0 for 5, and needing some offense, it was Reed who struck with a game breaking 72 yard touchdown to get the Bills into the game 7-3. Reed went on to catch 6 for 115 yards and a touchdown as he was matched up against All Pro Cornerback Frank Minnifield all day. The 34-30 loss was one of the greatest games in NFL history and the nation’s first glimpse of what was to come. By 1990, with James Lofton now entrenched as a starter on the outside, the Bills ran their 3 receiver no huddle offense from the outset of the season and not as a 2 minute offense. At the time, they made a then unheard of decision to have Reed play in the slot instead of the “Z” receiver. This isn’t like now where defenders aren’t allowed to really tee off on receivers running inside routes. He was never going to be the receiver running under picture perfect bombs again. He had to fight for yards the tough way….after the catch in the middle of defenses. As for the Bills offense?? 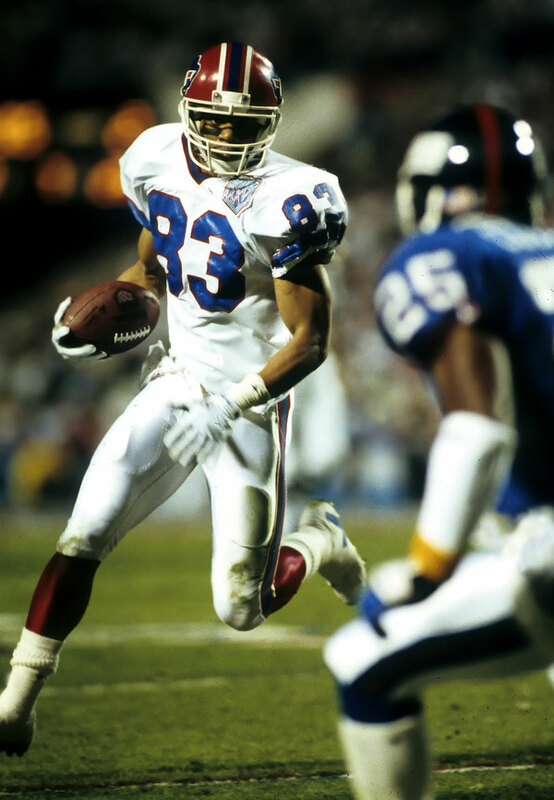 Andre Reed tries to avoid Mark Collins in Super Bowl XXV. Over the next five years, the Bills finished #1 in offense 3 times as the team went on to 4 Super Bowl appearances. During that time Reed amassed 288 receptions for 5,128 yards and 35 touchdowns on one of the offensive juggernauts in NFL history. While teammates Jim Kelly and Thurman Thomas won several offensive player of the year awards and an NFL MVP in 1991, it was Reed who was the only Pro Bowler in all five of those seasons. The attention defenses afforded Reed on the inside is why Lofton reemerged as one of the league’s deep threats. Thanks to 2, 1,000 yard seasons, Lofton retired after 1992 as the NFL’s yardage reception leader with 14,—- yards. The last few years of his career propelled him to Canton as a Hall of Famer thanks to Reed’s sacrifice within the team’s offensive structure. One of the greatest aspects of Reed’s career was his performance in the postseason. We already alluded to the great game he had against the Browns in 1989. In ’90 the Bills had homefield throughout the playoffs yet Jim Kelly had missed the last three regular season games. Experts weren’t sure they could pick up where they had left off, until Reed caught a shallow crossing route, broke two tackles turning it into a 40 yard touchdown. 7-0 and the Dolphins were hanging on for dear life. In a 44-34 triumph, Reed scored the clinching touchdown on a similar play from 26 yards out. On the day he caught 4 passes for 122 yards and a pair of scores. In 1992, Reed was the Bills only top shelf performer in the AFC Wild Card tilt with the Houston Oilers. After spotting the Oilers a 35-3 third quarter lead, Buffalo roared back to win 41-38 in the greatest comeback in NFL history. Both Hall of Fame quarterback Jim Kelly and Hall of Fame running back, Thurman Thomas didn’t play that day. All Reed did was team with Frank Reich, gather 8 receptions for 136 yards and 3 second half touchdowns including the one that tied it at 38 to force overtime. Although the Bills were beaten soundly in Super Bowl XXVII, Reed had another spectacular performance with 8 receptions for 152 yards, breaking two catches for over 35 yards in the second quarter to keep the game close. At halftime the Cowboys jumped his routes on their way to a blow out win. He was that much a factor early….but Dallas pulled away 52-17. The ultimate reason Reed is a Hall of Famer is the way he played. Without being the size of a linebacker like Brandon Marshall, Terrell Owens, and this huge new breed of receiver, Reed only stood 6’2 and 190 lbs, yet he didn’t catch short passes and slide to the ground waiting to get touched down. He stiff armed defenders and ran through arm tackles for most of his touchdowns. He was the greatest ever receiver when it came to yardage after the catch. As you saw in the latest film, he caught passes over the middle and only when the Bills caught teams in a blitz did he sight adjust to a longer pattern. Otherwise he ran through defensive backs with ease. 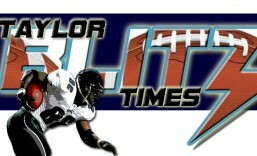 Over his 16 year career, he gathered in 951 receptions for 13,151 yards and 87 touchdowns. He ranks 10th all time in receptions and his 27 receptions in Super Bowl competition is 2nd only to Jerry Rice. Had Andre Reed not sacrificed for the good of the Bills offense, would James Lofton have made the Pro Football Hall of Fame?? Would Jim Kelly and Thurman Thomas?? For a period, Kelly and Reed held the record for most touchdowns by a combination in NFL history. They wrested that mantle from Johnny Unitas and Raymond Berry, which has since been broken by Peyton Manning and Marvin Harrison. The closest duo in the 1990’s was Steve Young and Jerry Rice. All of these players are either in the Pro Football Hall of Fame or a shoo-in to get there as the count down for Manning will start this February. Only Marvin Harrison and Andre Reed are on the outside looking in. Reed deserves to be in the Hall of Fame for his fearless play. This entry was posted in Players Who Should Be In the Hall of Fame and tagged Andre Reed, Andre Reed Hall of Fame, Andre Reed Should Be In the Pro Football Hall of Fame, Buffalo Bills, football, NFL, NFL Players, Pro Football Hall of Fame, sports. Bookmark the permalink. They sat that ignorance is bliss and if that’s true then I’m blissfully ignorant because I thought he was already in the HOF. Is he still eligible? Unbelievable! I would like to know what kind of cigarettes the sports writers were smoking when his name was on the ballot. Is he still eligible Jef? Yes he is….but there are a slew of other players coming eligible that might nudge him out. It seems like the committee doesn’t like multiple people from a given position to go in a given year. The early 90’s and late 80’s Bills were a great club. Reed does need to be in the HOF!